Grow some flavorful winners in this year’s garden with these 2019 All-America Selections vegetable winners. They’re tested and selected for their performance in home gardens and containers. You’ll enjoy Just Sweet pepper’s small sweet fruit as snacks or lunchbox treats. The bright yellow 3” fruit are sure to brighten any container or garden. Wow your guests with Orange SilverWave melon. The extremely sweet firm orange flesh contrasts nicely with the light green rind with its splotchy stripes. Save space and reduce the risk of disease by growing this on a fence or trellis and the fruit supported with a sling. 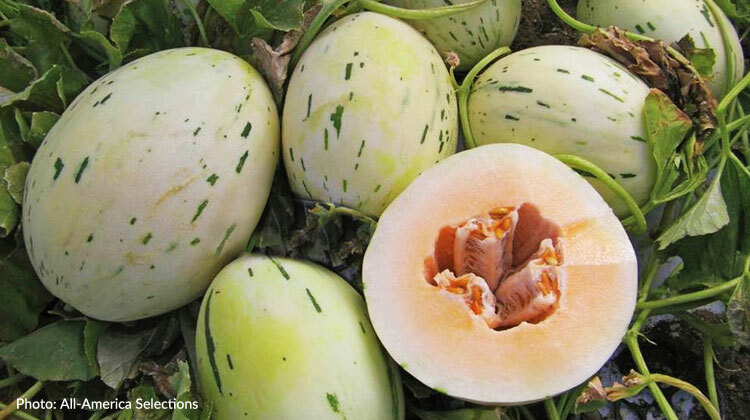 Cal Sweet Bush watermelon is perfect for containers and small space gardens. Each bushy vine grows only 14 to 18” long, but produces several 10 to 12” watermelons and at least one fruit per vine when grown in a pot. A bit more information: Vine crops grown vertically can be an attractive element in any size and style of garden. Use an attractive obelisk or trellis and decorative sling in keeping with your overall design. You’ll save space and enjoy the vertical interest and produce the plants provide.